Is Final Cut Pro X finally ready to be viable replacement for Final Cut Pro Classic? This post is a follow-up to the “Final Cut Pro X for Final Cut Pro 7 Editors” workshop I did at Boston Neighborhood Network on Saturday, December 13, 2014. If you’re still editing with Final Cut Pro Classic (my way of referring to Final Cut Pro 7.x or earlier) and sitting things out, you will eventually confront a transition to a contemporary non-linear editing system, perhaps one of Adobe Premiere Pro, Avid Media Composer, or Final Cut Pro X. Adobe and Avid represent a comfortable, solid, and respectable alternative: the conceptual model of the interface and workflow is similar to what you’re used to with Final Cut Pro Classic, based on design patterns that have been with us since the late 1980s. Final Cut Pro X, on the other hand, reflects a post-millennial re-thinking of editing workflow and interface, and is worth considering. I don’t say this from the perspective of an Apple apologist, I’ve been using both Adobe Premiere Pro and Final Cut Pro X in my teaching and last summer transitioned my feature-length documentary project from Final Cut Pro Classic to Adobe Premiere Pro CC (because at the time Final Cut Pro X was not quite there), however, with the changes that were introdcued in Final Cut Pro X 10.1, especially in terms of media management, I finally consider Final Cut Pro X a serious contender. I tried editing with Final Cut Pro X the day it was first released. I quickly found some limitations that were show stoppers for me, the most serious around media management and relinking media files. Clearly the first release was the equivalent of an alpha release and deserved all of the derision, criticism, and the hilarious parodies. But that was then and this is now. Apple has been updating the software, fixing bugs, adding essential features, and it’s no longer the precocious inexperienced over-hyped curiosity it was when it was first unleashed on the market in one of the most ungraceful product transitions in software history. 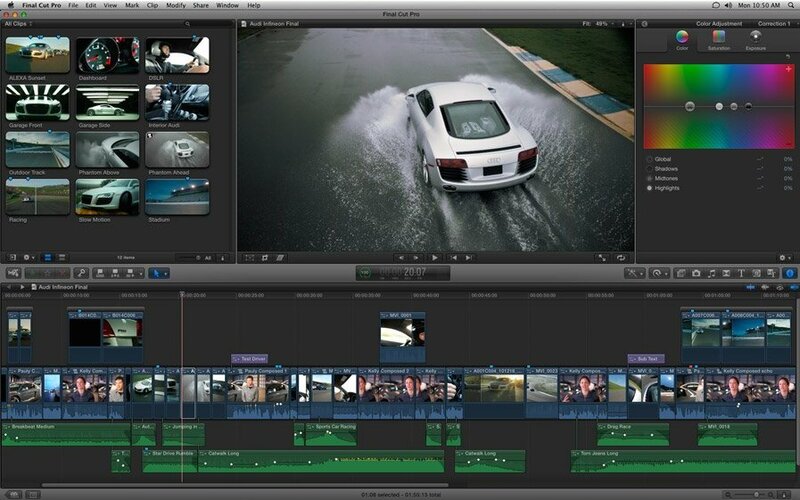 Final Cut Pro X 10.1 and beyond is a viable, respectable editing solution to be reckoned with. Prior versions were problematic for a host of reasons, so make sure whatever video your watching or article you’re reading refers to a version after 10.1. There’s no sane reason to work with older 10.0.x versions, unless you enjoy using software full of bugs and design problems. Today you can give Final Cut Pro X a try and be happy that many people before you went through the pain of using not-quite-fully-baked software so that you can have a smooth transition from Classic to X! While naysayers like to refer to Final Cut Pro X as iMovie Pro, that’s not necessarily an insult if you think about it carefully. Final Cut Pro X has streamlined the editing workflow and interface and brings some spectacularly sophisticated features to the party. Before anyone says bad things about Final Cut Pro X, I think it’s important to learn how to use it, and then speak from experience. I hear a lot of mis-information being spouted about Final Cut Pro X. And once again, I’m not an Apple apologist, nor have I played one on television, however, I do think that if you’re currently using Final Cut Pro Classic and you take the time to learn Final Cut Pro X with an open mind—and yes, you have to learn it, you can’t just dabble with it, it’s really quite different—you might be pleasantly surprised how it re-imagines and streamlines the process of editing. Any transition in our tool set is disruptive, especially if we edit day-in and day-out and have learned to play our tools like a piano, but at this point it makes no sense to hold on to Final Cut Pro Classic, the new affordances of contemporary editing tools, especially Final Cut Pro X, is just too compelling at this point to ignore. The timeline index allows me to navigate the timeline by jumping directly to clips, keywords, markers, and to-do items. This is the feature that finally tipped the scales for me: The new media management scheme allows me to place libraries and media anywhere on a network to optimize media management when multiple users are working on a project, this was a serious limitation of earlier versions, a deal-killer for me, however, now that I can start project on one system and hand it off to another editor to finish on a different system (as long as it has access to the media files) has gone a long way of warming me to the new ways of Final Cut Pro X. There are a lot of other cool features, I could easily make a top twenty list. If you want to understand whether Final Cut Pro X is the right editing system to transition to, you really need to learn how to drive it and practice driving it in order to make a decision based on your own experience. I suggest the best way to do this is by taking at least a full-day walking through the software using one of the following three resources to guide you. Then devote a second full day to editing a couple of short projects from start to finish in order to reinforce what you learned on the first day. Without this kind of deep dive, it’s really difficult to understand Final Cut Pro X, you have to spend time on the dance floor. The Final Cut Pro X 10.1.x Essential Training tutorial by Ashley Kennedy available on lynda.com provides an excellent, methodical tour of Final Cut Pro X, it will take anywhere between 7 to 9 hours to get through, depending on your pace. The Final Cut Pro X 10.1 Workflow and Editing tutorial by Larry Jordan provides over 16 hrs of detailed training updated for Final Cut Pro X 10.1 and later. Larry Jordan’s web site is a cornucopia of editing resources and his tutorials are first-rate. If you prefer to have an e-book by your side as you go through the software on your own, the Apple Pro Training Series: Final Cut Pro X 10.1 Quick-Reference Guide (Kindle edition) by Brendan Boykin will provide you with concise, well-organized explanations that will help you walk through Final Cut Pro X 10.1.x and includes quite a few tips and reminders along the way. This guide, combined with the online documentation, should get you through your first project with Final Cut Pro X. Create Subclips, if you simply can’t live without ye olde subclips, Roger Jönsson explains how to create them in Final Cut Pro X, this is just one of the many valuable articles you’ll find on Larry Jordan’s web site. If you have projects you want to transition from Classic to X, the 7toX utility does a surprisingly good job of bringing your Final Cut Pro 6 or 7 XML forward to Final Cut Pro X so you can update or finish older projects. I’ve had good luck using it with short projects. It helps if your media is well organized to start with. This utility translates metadata from an XML export of your Classic project (including bins, clips, subclips and sequences) to a Final Cut Pro X Event with clear, detailed reporting. Bins become Keyword Collections with original log notes and comments, Sequences become Compound Clips tagged with a Sequences keyword, Multicam Clips are supported, and the original track structures are represented by Roles. At some point in the future every Final Cut Pro Classic editor will reach the proverbial fork in the road. I would be curious to hear about your thoughts on the options and what your transition experiences are like. You can share them with me via comments to this post or if you prefer, contact me directly. Good luck with whatever road you choose to take, the journey is the reward. Thank you for such a thorough analysis. Great article. The Inevitability of working in 64 bits – especially in higher res does say that Final Cut X IS necessary to replace Final Cut Pro if you must stay with Apple Software. But in the bigger picture this debate ended a while ago. The actual replacement the industry has embraced for Final Cut Pro is Premiere and the entire Adobe suite.